The Ten Commandments was among the first lengthy passages of Scripture I ever committed to memory. Like most children, I was told to memorize the commandments and did so. Every week they were read in church, ensuring that they remained fresh in my mind. And yet, as I’ve grown older, I’ve realized that I think little about these Commandments, usually convinced that I am living by the letter of the law but rarely pausing to consider whether I live in the spirit of them. I’m a New Testament Christian, I suppose, often seeing little reason to look back to these laws, given so long ago. And it is to my shame, I’m sure. 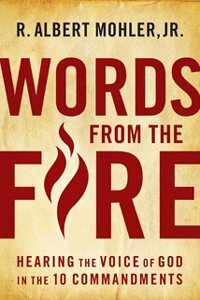 So it was some interest that I turned to Words from the Fire, a new book in which Al Mohler calls Christians to hear the voice of God in the Ten Commandments. The great crisis of our day, of the postmodern times in which Mohler writes the book, is one of knowledge. It is an epistemological crisis that goes to the very root of how we can know anything and, continuing on from there, what right we have to tell other people what is true and what is false. Mohler summarizes the question in this way: “How do we know and teach what we claim to know and teach?” The great challenge for Christians, in face of such questions, is to “make certain we know on what authority we speak, and know, and teach.” As Christians our claim is not that we have something to say or that our words merit attention. To the contrary, we claim that God has something to say and has chosen to say it through us. We speak only because he has spoken and we ought to speak only what he has spoken. The format of the book is dead simple and really exactly what you would expect–after an Introduction there are ten chapters for ten laws. This Introduction is excellent, structured around eight “if’s.” If we grant that God has spoken as Creator to his creation, there are eight things we must now acknowledge: that we now do know; that we know what we know only by mercy; that we too must speak; that all of creation is about God; that God has spoken for our good; that we must obey; that we must trust; that we must witness. “We are here because God has spoken, not only in the fire, but also in the Son–in whose name we gather as the church and in whose name we serve. The voice at Horeb points to its ultimate fulfillment in the incarnation of Jesus Christ, the Word of God incarnate. For beyond the miracle of Israel hearing God’s voice and surviving, we can now know the Word of God made flesh…and be saved.” And from this starting point Mohler consistently shows how the Ten Commandments are relevant to us today and how God calls us to obey them; he shows how they are all a work of God’s grace. And always he points to the ultimate fulfillment of these commandments in Jesus Christ, the one in whom the law has been fulfilled. These are commandments we can know and obey and delight in today in a way that the ancient Israelites could not even imagine. If I were to point out a potential weak point in the book I’d say that strangely and rather surprisingly, I noticed several little editing oversights–a missing quotation mark here, a missing word there, an overuse of a word in a few other places. There are only a few such things, but still more than I would have expected. It is certainly not enough to detract from the message of the book but still enough that I made a note of it.